Directions: One can either take US 62/180 from Carlsbad, NM or from El Paso. 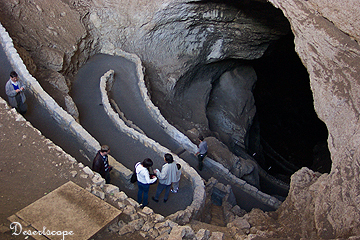 At the Cavern sign, take Walnut Canyon drive, a seven-mile scenic drive, to reach the parking lot and the visitors' center. 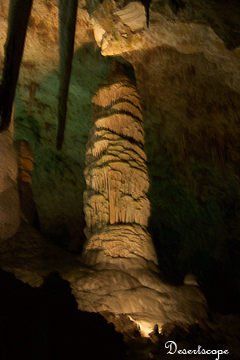 Carlsbad Cavern National Park contains one of the world’s largest caverns. With the exception of December 25th, the park opens year around. The park was operational since May 14th, 1930. The Big Room, is about 4,000 feet long, over 600 feet wide and over 300 feet tall, is considered the number seven largest cave in the world. The cavern is several miles walk downward. The good news for the people out of shape is the way back is simply. One can take the several long minutes ride in the elevator and finally reach the visitor’s center. 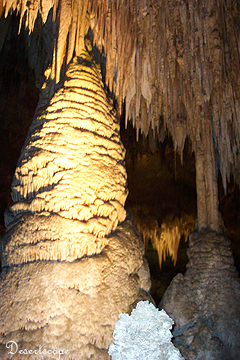 There are a over 100 caves in the Park, but only two are open to the public. The Carlsbad and Slaughter Canyon Cave. The Slaughter is still in its primitive stage and only guided tour are offered. The Lechuguilla Cave, which many claim to be the most beautiful cave in the world, is still hidden from the public. Only the BBC series Planet Earth offered glimpses into that strange and magnificent world. At dust, when weather permits, one can sit outside and witness thousands of bats fly around, chasing for bugs, and eventually retreat back into the cave.